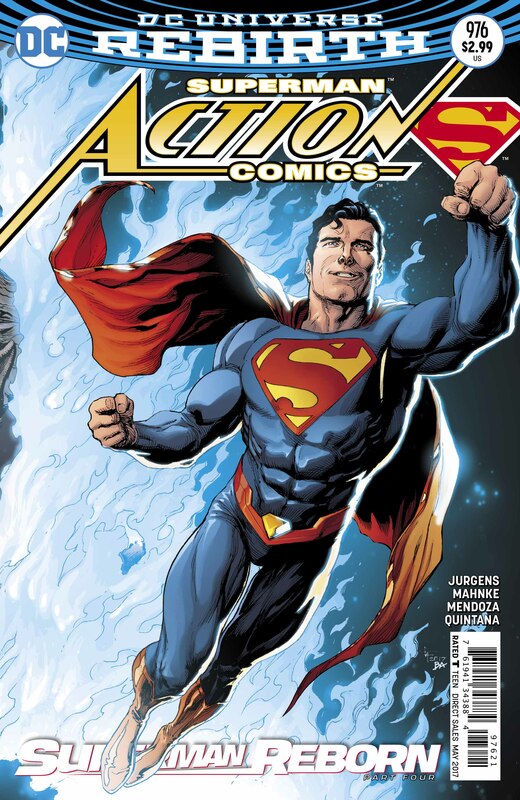 While not a spectacular finale, Action Comics #976 is a satisfying conclusion to "Superman Reborn." 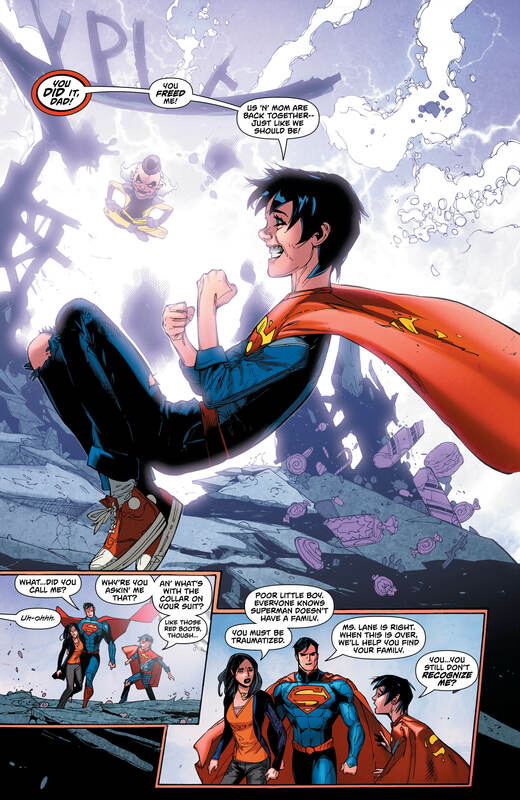 “Superman Reborn,” the four-issue crossover event, comes to a close in Action Comics #976. While it’s likely to go down as the weakest installment of the lot, it’s still pretty decent, which is testament to the arc’s overall and consistent quality. It’s been a wild ride, but all good things must come to an end. Unlike the three issues before it, there aren’t many earth-shattering revelations here. 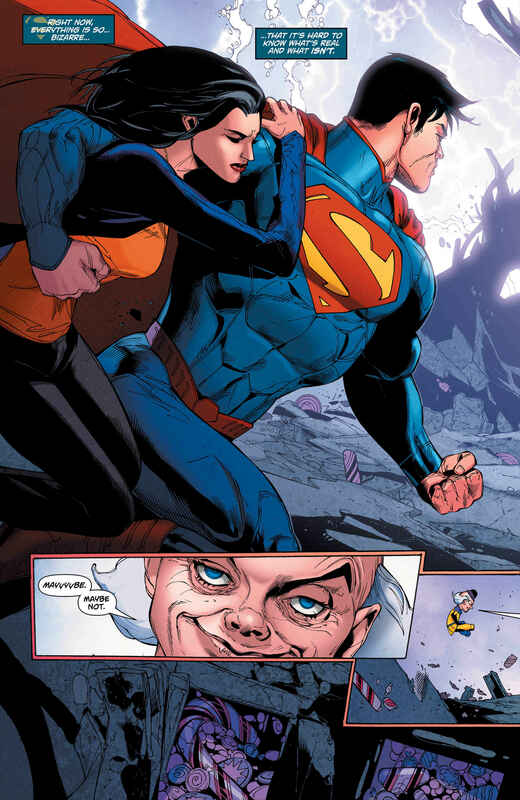 New 52 Superman and Lois Lane have re-emerged and challenge Mr. Mxyzptlk; however, they don’t recognize Jon Kent. 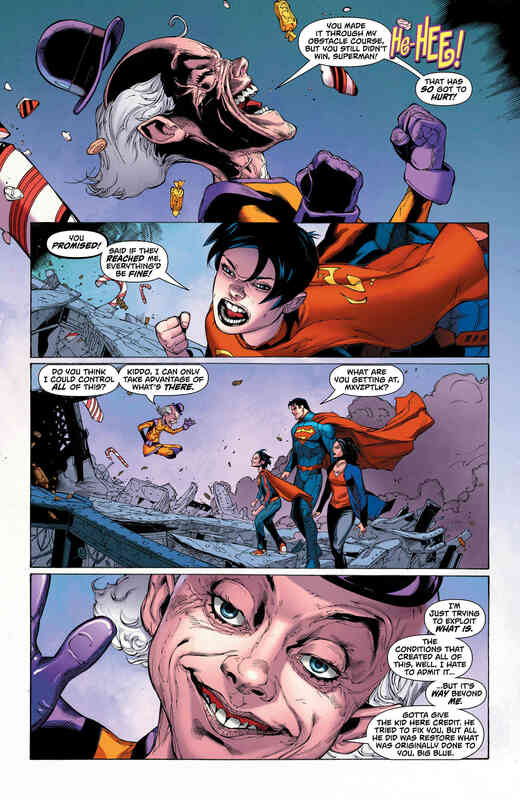 The poor Superboy does his best to remind them that he’s their son (well, in a different reality), as Mxyzptlk tries to slip away. 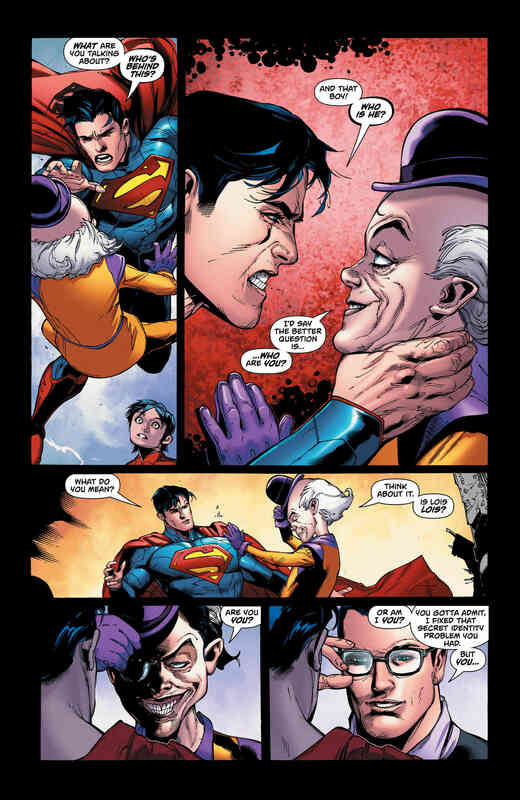 Refusing to let the imp leave, Superman battles him while Jon speaks to two new blue energies that surround him. Dan Jurgens closes this chapter in fine fashion. Rather than hit the gas and aim for a smashing finale, he chooses to bring it down to Earth, coolly and calmly. Superman fans will appreciate how he instills a lot of heart and soul in this story, and that’s all you could really ask for from a Man of Steel book. This isn’t a go-for-the-jugular type of tale, so it’s a suitable and sensible ending that’ll have its ramifications felt throughout the universe for a long time. 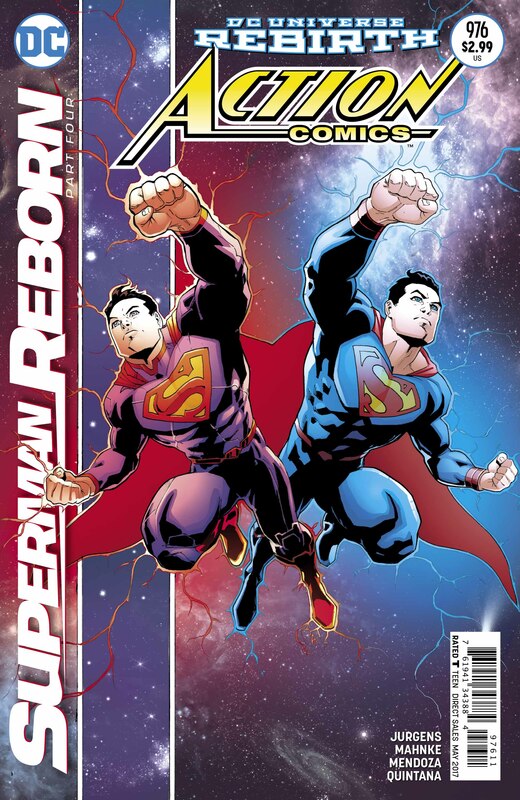 While it’s a satisfying conclusion to “Superman Reborn,” I can’t help but feel DC ruined it with the news of Superman’s new costume months ago. Even after the events of Superman #19, you could guess where this story was leading. Unfortunately, this is a pitfall of the Internet age, as nothing’s sacred or surprising nowadays (all hail the spoiler generation). 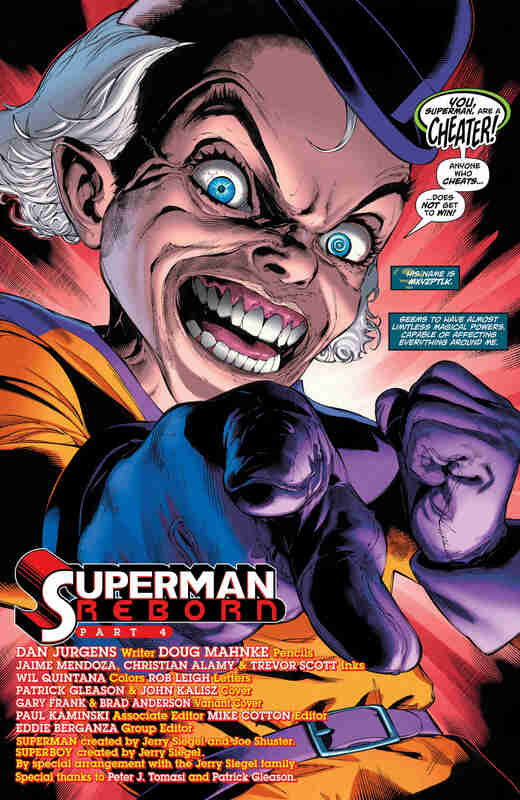 Considering how guarded DC kept Mxyzptlk’s reveal, however, they could’ve at least tried to do the same with the costume. Visually, Doug Mahnke does a decent job of bringing Jurgens’ story to life. 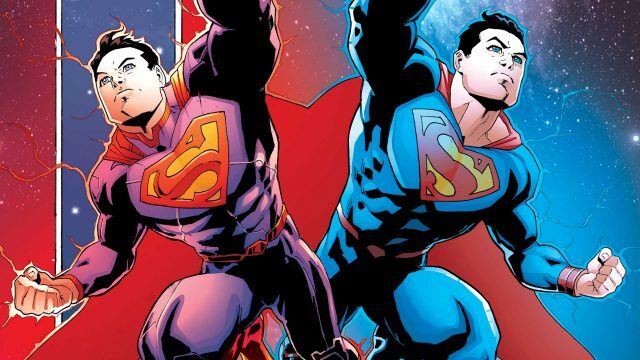 His work on Action Comics #975 is evidently much superior to this one, but he keeps it simple and lets the colors shine instead. Even if it’s far from spectacular or amazing, Mahnke saves the best for last as he brings together the reunited “Superfamily” for one iconic pose. I have no doubt this image will become a hallmark of the series. All in all, Action Comics #976 adequately wraps up this saga and opens the door for the rest of Rebirth’s secrets to tumble out. The pieces are popping up; now, it’s up to us to put it all together. Keep an eye out for The Flash #19 and Hal Jordan and the Green Lantern Corps #17 as well, since they’re rumored to contain clues to help solve this mystery.